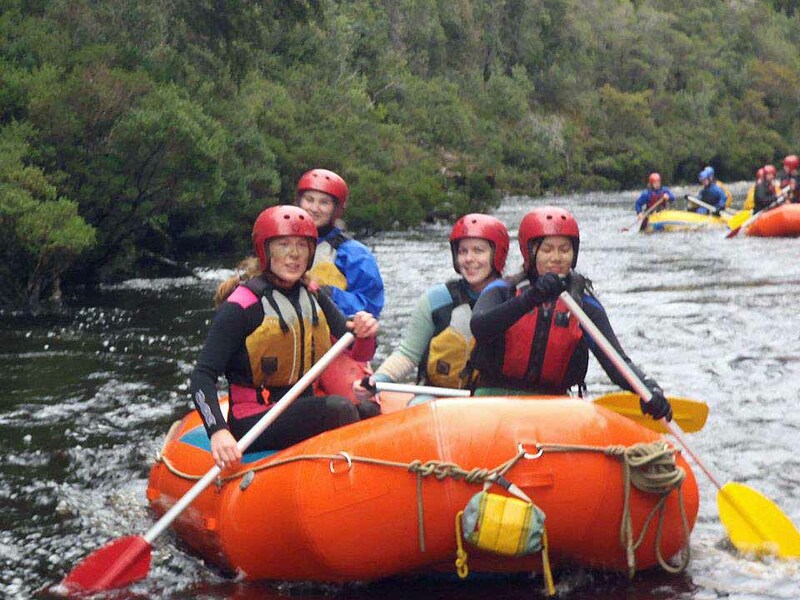 Fed by streams originating in the Tasmanian Wilderness World Heritage Area, the Weld River flows peacefully through the island’s south west. Only a few kilometres upstream of its merger with the Huon River, the tannin-stained waters plummet violently into rapids, though downstream, it is tranquil and still. The river gurgles lazily along, beneath the dappled shade of the wet eucalypt forest and the dangling needles of Huon Pines, whilst ducks punt cheerfully across the reflective surface of the tea-coloured river. Then, drifting indistinctly through the breeze, comes a sound terrible enough to send a chill through an innocent family of wood ducks. As the sound draws nearer, there is no mistaking its source, and the family of ducks take to wing, the peace of the Weld River shattered. The shrill, loud cries echo across the expanse of water, and – no longer reserved by anticipation of any upcoming rapids – the words from the Disney movie are belted out mercilessly from a single raft. Inexplicably, the other rafts keep their distance, but there will be no restraining the singing (except for the all-too-frequent forgetting of lyrics) until the end of the trip, when the delicious bakery goods will once more ensure silence is returned to the peaceful river. 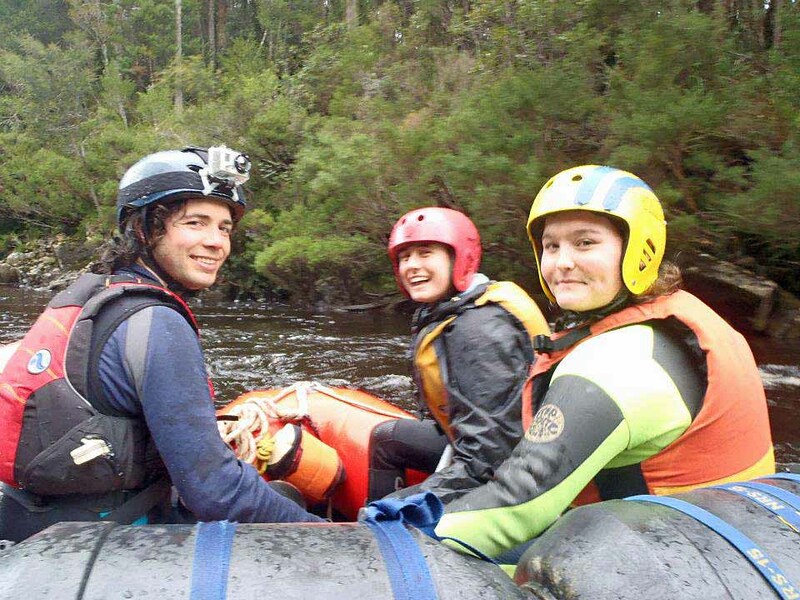 And so went the experience of rafting the Weld for a Tasmanian University White Water Rafting crew in late July of 2012. We took four rafts (an Angel, an Incept, and in Emma’s words “two new gaudy techo coloured, completely unpatchable, things”) for our group of 15 people, and once we had gained the perpetually late Toby we headed off. Down in Huonville we gorged on the traditional indulgence in bakery goods, and thus caffeinated, jittery from the sugar and thrilled by the prospect of the rafting, it wasn’t too far to drive down to the get-in point at the Weld. There was an over-excited rush to start pumping up the rafts, before everyone was reminded that we needed to don wetsuits first. All were duly impressed by my hot pink and black acquirement from the South Hobart tip shop ($8). Many the sexual innuendos were made, especially with three girls grunting and writhing in an attempt to help Bex into her own tip shop bargain. 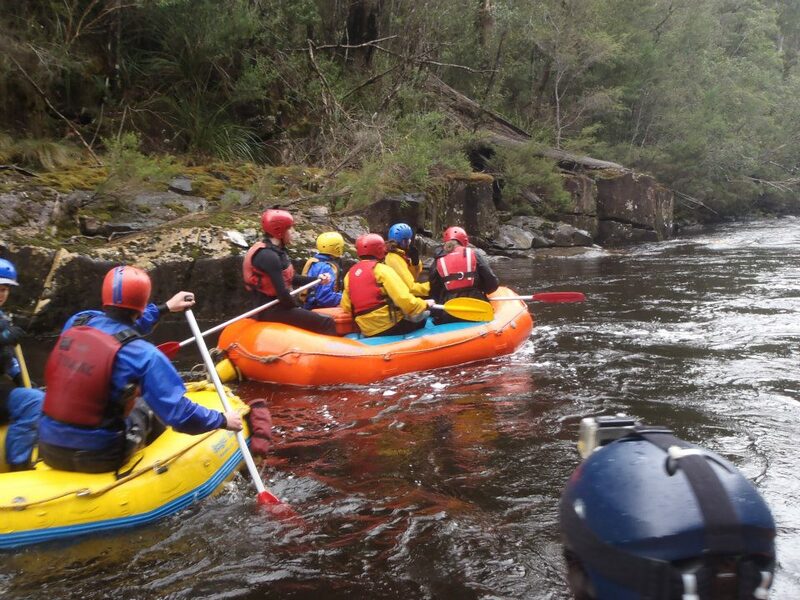 Finally the drivers departed, and the rest of us were set to finish off the rafts. Unluckily, Mei and I were standing too close when Paddy was looking for trainee guide victims to tie down the safety equipment. Quantity over quality: many the camstrap was used, and several extra for good measure, before the gear frame was deemed adequately attached. Then, the challenge of porting the rafts down the steep, slippery embankment to the river – and not without seriously contemplating the prospect of throwing the rafts off the bridge and jumping in after them. Mei and I adorned ourselves with some war paint, and when Stacy suggested that the greenish mud might be good for our skin, we lathered some more on our noses – the resulting effect being less reminiscent of Braveheart and more of a cat. At this point, half of our drivers returned, though they wound down the window to inform us that one was missing. To no one’s surprise, the Ward of the trip had managed to get lost. The drivers informed us that they would go back and search for Nicko, and so the rest of us were left to wait it out. There was some standing around, and Paddy throwing rocks off the bridge because he was bored. There was some standing around, and the drinking of Paddy’s wonderful ginger and lemon tisane. Then there was some more standing around, and the eating of Paddy’s wonderful Boston Bun. And finally Emma decided that there had been enough standing around. The two of us went for a run down the road in wetsuits – not necessarily because we could offer much help, but to feel as if we were doing something. It was a superb day, though Emma and I did ponder what had become of the lost Nicko, and the rescue team of drivers. My own conviction was Tasmanian red necks, and I could almost hear the sound of banjos duelling in the distance – and then we realised we could hear an unrecognised car drove along the forestry road towards us. The car slowed, the window was wound down, and then… we were greeted by the friendly couple in the car. They informed us that someone had been left by the side of the road whilst the others went on an epic search mission. (We later learned that the valiant and wilderness experienced Sarah had been abandoned to the roadside (and the locals) so that the boys could play their music louder.) The car drove off, and we jogged on, though my eyes were peeled for bogan axe murderers. Still, only another kilometre down the road we were picked up by the drivers. Catching a lift back to the rafts, we were informed that Nicko had driven all the way upstream to the Tahune Airwalk before turning back around. Even so, we had just enough time left to get onto the river, and without further ado Paddy delivered a fast but impeccably comprehensive safety brief, and we were off. Our rafts were guided by Paddy, Rob, Toby and Emma, as Nicko’s hand was injured from skiing in New Zealand, and Mei and I tend to habitually wrap rafts (and, in my case, kayaks too). So instead, Mei and I seated ourselves in front of Emma and Stacy, and almost the moment we pushed off from the riverbank, we burst into song. So sung Pocahontas, and – very loudly, multiple times, and slightly out of tune – sung Mei and myself. As per usual with Disney, the lyric writers had discerned a universal truth (in much the same way as “Hakuna Matata” from The Lion King presents a philosophy of acceptance in the face of adversity, The Jungle Book’s “Bare Necessities” shows us how to live in harmony with nature, and “Some Day My Prince Will Come” from Snow White shows to all women that we must wait around for the perfect man…). This time, Disney had recognised a truth known by rafters for some time: rivers are always changing entities, and each trip is a unique experience. This is especially true when one hasn’t rafted for nearly a year (this trip was before kayaking experience had made even the Grade IV Cataract Gorge seem comparatively easy to me). We nervously approached the first rapid, though Mei and I were more seriously concerned about how many lines we’d forgotten. We had more than a dozen Disney songs between us, but knowing only half the lyrics caused a few monologues, and I struggle to hold a tune at the best of times. Still, we quietened as we watched the other rafts descending the turbid water. Paddy in the sweep boat had no problems, and swung them through the rapid with ease. Toby guiding the Angel had less luck. Somehow, both he and a punter managed to plunge themselves into the icy, frothing waters, losing a paddle in the process. To the surprise of many, it was Simon who rode safe and dry like a professional – admittedly, seated at the bottom of the raft, and thus with an impressively low centre of gravity. Nevertheless, he survived the rapid without a swim. We waited above the rapid whilst the Angel collected its lost passengers, and then forward paddled at our guide’s command. Superbly, we shot through the rapid without a moment of fault, and congratulated Emma for her guiding mastery on the far side. Managing to hear Emma’s shout for forwards over our renewed musical, we pressed onwards. The next rapid was a little more of a struggle. We had to go down the left side of the right chute, but we stumbled across some barely submerged rocks and were swept far left. We easily found an eddy on the bank, but several attempts to paddle our way upstream were unsuccessful. Eventually I just hopped out and dragged the raft back up with the bow line, though we were again not strong enough to make it to the right chute. Some more upstream dragging, and we could shoot down the right chute without any problems. In fact, we even managed to pick up the lost paddle from the last rapid. The rest of the river was comparatively easy. Well, for some people. Stacy admitted later to the desire to throw herself into the river each time Mei and I sung… as a close second preference to throwing us in the river. 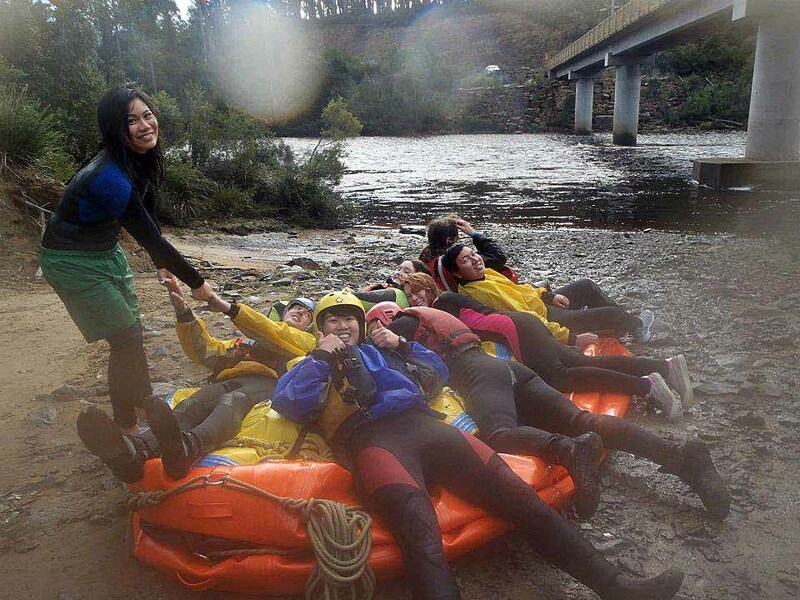 Still, we found ourselves at the confluence with the Huon without any problems, though we were surprised that our raft of females was making a better pace than the other rafts. 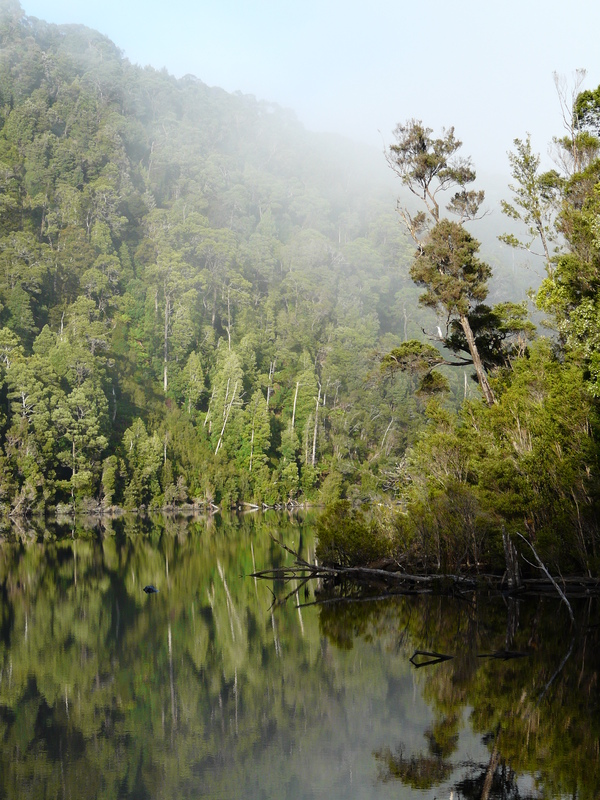 We admired the Huon Pines dangling into the tannin river, and the peaceful ducks punting the shallows. I even inspired Paddy’s raft, of Bex, Sarah and Nicko, to burst into a rendition of Queen’s “Bohemian Rhapsody”, though whether they sung all 13 minutes of it or not I cannot confirm. At last (in fact, in quite good time), we found ourselves at the get-out under the Southwood bridge. 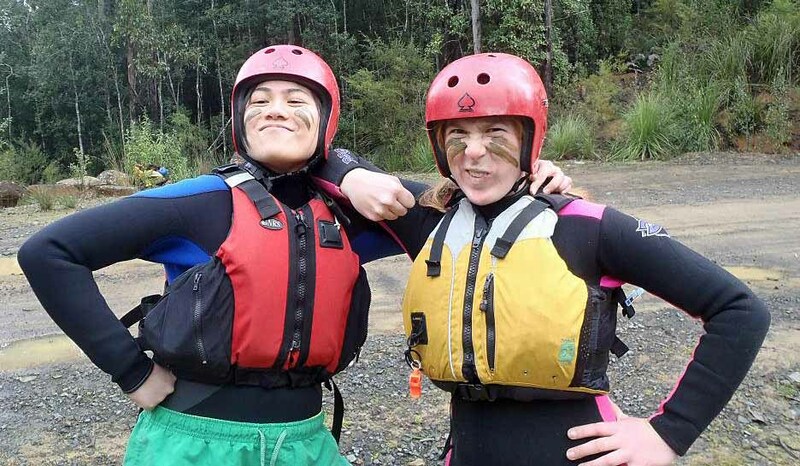 We washed the mud from our faces (including some spectacular wet-hair-flicks from Mei and myself), rolled up the rafts, and waved at the tourists who were watching us stripping out of wetsuits into warm, dry clothing. There was the sharing of more gingery tisane and hot chocolate, as well as the bakery goods, and the singing was done at last (until the car. Poor Toby). We talked of old trips, and life plans, and sexual innuendos were enjoyed by all, until we decided that it was time to return to the sheds. The rafts were loaded, and the cars driven back up to the road, with even Nicko Ward managing to find his way out of the maze of forestry roads. The Weld and the Huon were returned to their peace, for now, as the sound of Disney faded into the distance. 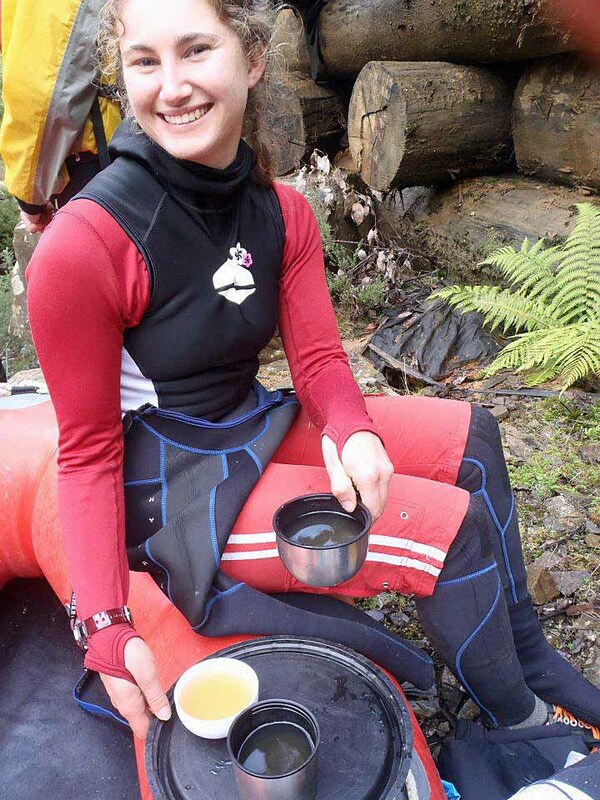 Photos courtesy of Patrick Lyden, except for the first, which is actually one of my photos from the Franklin River. 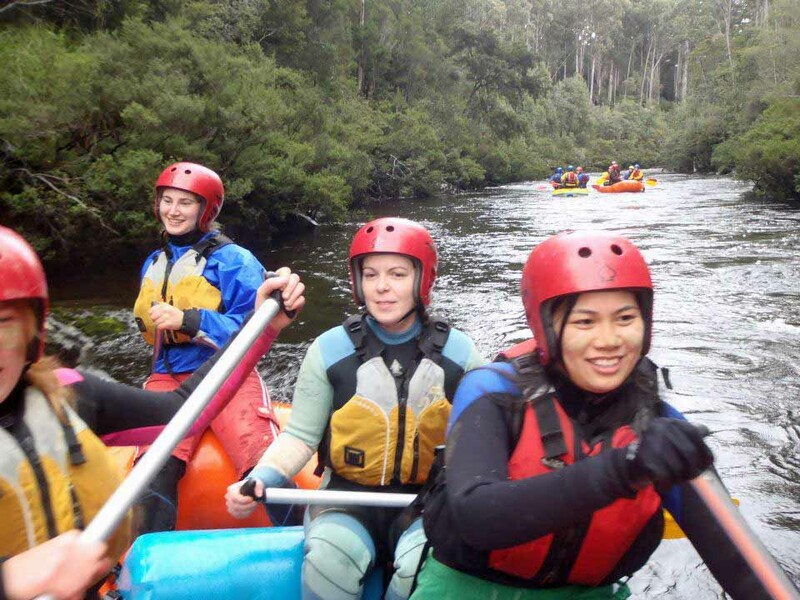 This trip description and photos first appeared in Issue 42 of Hang On, the Tasmanian University White Water Rafting Club’s magazine.